The large mouth hole and the flexible, comfortable, supple yet strong Neoflex material (which is only available at Slick It Up) makes for a great hood because its still easy to "work in" but looks and feels totally hot. You take away the eyes and its even more fun. 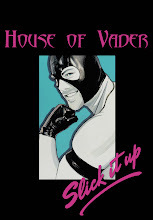 Pick one up at a discount using coupon code "houseofvader" at SLICK IT UP now! Hoods are good! :) Sorry to be tardy...I'm running a day late and a dollar short lately, LOL! Please have mine delivered FEDEX with Adam wearing it !! I thought you might like to see this octupus teapot.